The High Violets - "44 Down"
From Portland, Oregon, The High Violets play a dreamy rocking brand of space pop that brings to mind a cosmic indie rock version of the Velvet Underground. The songs are accessible and catchy, but they are also a bit more adventurous and certainly more psychedelic than standard indie rock. The band consists of Clint Sargent on guitar and vocals, Luke Strahota drums, Allen Davis on bass, and Kaitlyn Ni Donovan on guitar and vocals. The High Violets excel at creating atmospheric rock that is infused with the spirit of 60's psychedelia while retaining a sound that is fresh and anything but retro. The title track consists of dreamy space-pop. Kaitlyn's vocals are cosmically hypnotic and backed by bubbling and shimmering psych guitar embellishments, especially during the trip-out segment where the guitars stretch out a bit. Good stuff. On the surface "Fa" sounds like more of a standard rock song but the space elements are still much in evidence, including those luscious guitar bits. "Colors" and "Julia" include head boppin steady rock beats and nice whining guitar licks. Both very good songs. "Sparkle" and "Wheel" feature intriguing psychedelic trip-pop. And "Dream Away" is probably the most 60's spirited song of the set. It has a full wall of sound feel and the guitars and vocals will carry you away on a cloud. Overall, this is an impressive set of indie rock oriented psychedelia that offers far more to the listener than the indie rock tag would imply. The CD is a mere 34 minutes but the band make their statement clearly and left this listener hungry for more. 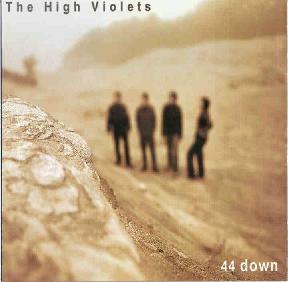 For more information you can visit The High Violets web site at: http://www.thehighviolets.com. CLICK HERE to read the Tales of the Action Man story in AI #21 that included a High Violets cameo.